Dan Albert’s farm is far from traditional. There are no picturesque, rolling fields, no tractors tilling soil; there is no white farmhouse or red barn. For that matter, there is no soil, or sunlight. The farm, Farmbox Greens, is inside a two-car garage behind Mr. Albert’s Seattle home. It consists of 600 square feet of microgreens grown in vertically stacked trays beneath LED lights. The ability to grow in such a small space is the result of hydroponics, a system in which a plant’s roots sit in nutrient-rich water instead of soil. Microgreens — the first, tiny greens on plants like arugula, radishes and bok choy — can go from seed to harvest in less than two weeks. That enables Farmbox Greens to compete on price against produce delivered from far away. “We are fresher and our greens last 20 to 30 percent longer than those grown outside the area,” said Mr. Albert, who co-owns the farm with his wife, Lindsay Sidlauskas. It has revenue of under $500,000, but was profitable enough in 2014 that Mr. Albert quit his day job as a landscape architect to farm full time. He now has three employees and sells his greens to about 50 restaurants in the Seattle area, a local grocery chain and four weekly farmers’ markets. Consumer demand for locally grown food and the decreasing price and improved efficiency of LED lighting are driving the creation of more so-called vertical farm start-ups, said Chris Higgins, editor of Urban Ag News, which follows this segment of farming. 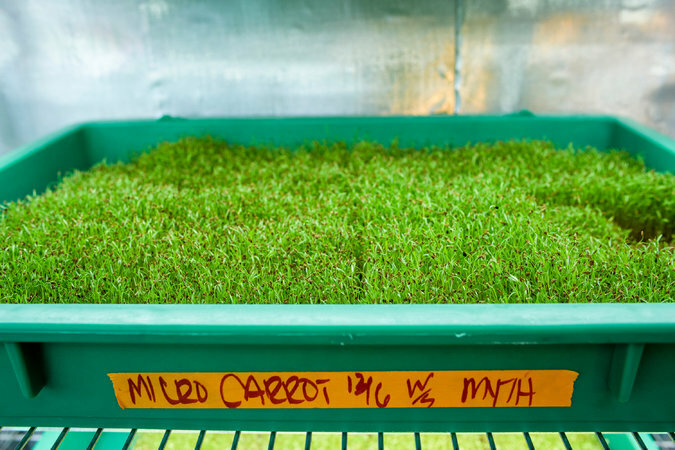 Carrot microgreens, ready to harvest at City-Hydro. Energy costs are still a significant barrier to success, making few vertical farms in the United States profitable. Those that are tend to be smaller ones. They include City-Hydro, a farm built in a spare bedroom on the second floor of Larry and Zhanna Hountz’s three-story rowhouse in Baltimore. Mr. Hountz came to urban farming out of necessity. After a serious car accident, he was unable to leave his house for two years and had trouble concentrating. He couldn’t go back to his previous job as a digital security consultant. He converted a 10-foot-by-15-foot bedroom in their house into a vertical farm. He raises 80 different varieties of microgreens that are sold to about a dozen local restaurants. Mr. Hountz said the farm generated about $120,000 in income, and he did not plan to expand. “We want to keep it a mom-and-pop operation,” he said. Vertical farming uses no chemical pesticides and far less water and fertilizer than traditional farms, but energy costs can be high. Even the best LED lights have only a 50 percent efficiency rate, said Bruce Bugbee, a professor of crop physiology at Utah State University who studies controlled environment agriculture. That means half the electricity is converted to heat, not light. 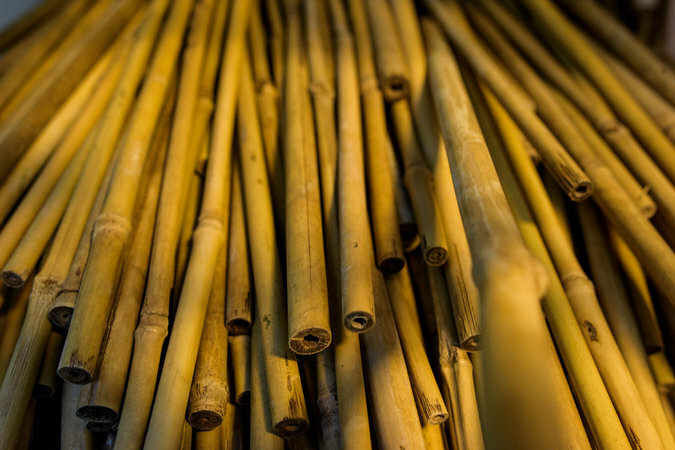 Bamboo is used to separate the coconut fiber substrates, where the microgreens grow, from the bottom of food-safe trays, encouraging air circulation and helping prevent mold. The upshot is that indoor farming can produce as much as 20 times the amount of food per unit area as conventional outdoor farming, said Gene Giacomelli, the director of the Controlled Environment Agriculture Center and a professor in agricultural and biosystems engineering at the University of Arizona in Tucson. As these farms scale up, however, they will need more electricity, not just for lighting but to run equipment like pumps and fans, Mr. Giacomelli said. Green Spirit Farms in New Buffalo, Mich., is one operation that has found a way to be profitable on a slightly bigger scale. The farm produces leafy greens like lettuce and kale in half of a 42,000-square-foot former plastics factory. Greens are grown hydroponically, in columns of stackable trays six levels high under “frequency-specific” induction lights. The light frequency used dictates what nutrient mix the plant gets, said Milan Kluko, Green Spirit’s co-founder and chief executive. Green Spirit runs its system mostly on off-peak energy, from 7:01 p.m. to 6:59 a.m., when rates are 30 percent lower. The frequency-specific LED lights allowed the company to cut energy use 45 percent in the last six months, while crop yields have increased by about 40 percent. “That’s been a huge breakthrough for us,” Mr. Kluko said. The farm’s electric bill is about $7,000 a month now, and will most likely drop to $5,000 a month by year’s end, he said. The farm employs 11 people and produces about 5,000 pounds of mixed greens a month (7,000 pounds a month in the summer), selling to restaurants and retailers within a 100-mile radius. It has raised $1.5 million from investors and its annual sales are more than $1 million. Such successes are prompting other vertical farming operations to grow, and grow big. Investment in food and agriculture technology start-ups was $4.6 billion in 2015, nearly double what it was in 2014, according to AgFunder, an online investment platform for the agricultural technology industry. And local foods generated $11.7 billion in sales in 2014, which is predicted to increase to $20.2 billion by 2019, according to the consumer market research firm Packaged Facts. 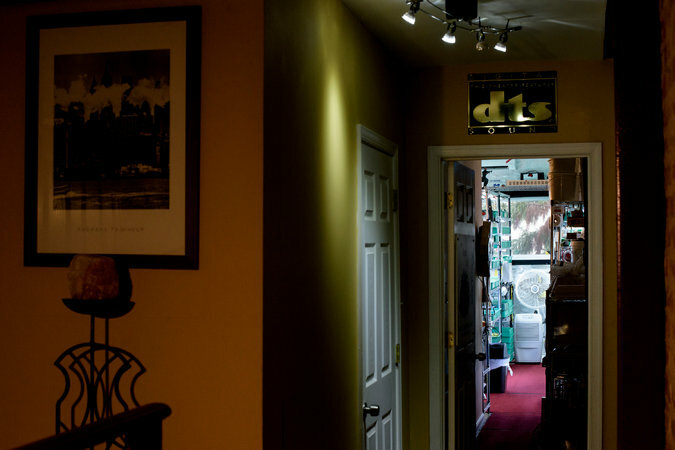 City-Hydro was started in a room that was once a home theater. The vertical farm now earns about $120,000 a year. Edenworks, in the Bushwick section of Brooklyn, uses an aquaponic system, which allows both plants and fish to be farmed at the same time, creating a self-regulating indoor ecosystem. Tilapia are grown in tanks and their wastewater is pumped through a bioreactor where composting bacteria turn waste into fertilizer. 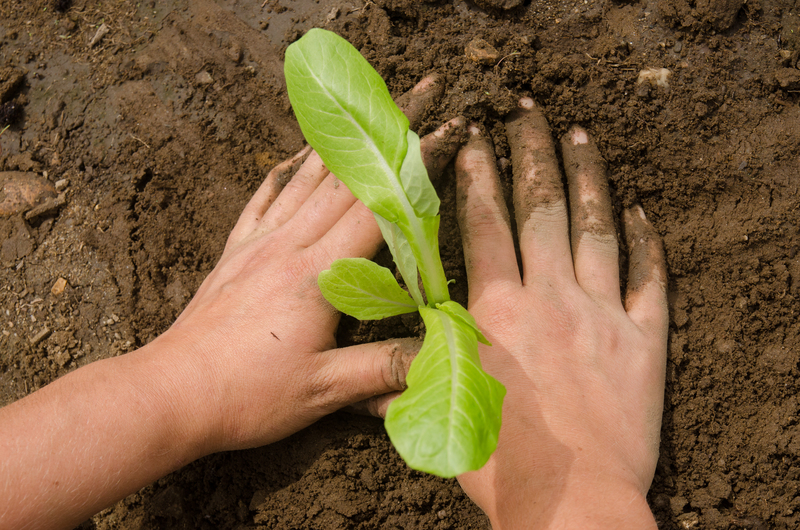 Plants use the fertilized water to grow and then the water is returned — minus the fertilizer — to the fish tanks. When the cost of LED lighting decreased, the company changed the greenhouse into a vertical, indoor stacked system, using shade cloth to block light and mimic a warehouse environment, said Jason Green, a co-founder and chief executive. Edenworks, which is not profitable, has received $1.5 million in funding and intends to build a 10,000 square-foot vertical farm in a vacant Brooklyn warehouse, which is expected to open before year’s end. Mr. Green said it should produce 130,000 pounds of leafy greens and 50,000 pounds of fish annually. Yet profitability can be elusive for aquaponic farming. According to a 2015 Department of Agriculture study on the economics of aquaponics, raising fish indoors is two to three times as expensive as raising fish in open ponds. Such setups are also labor-intensive, with multiple systems requiring constant monitoring, in addition to harvesting and packing. A peer-reviewed survey of commercial aquaponics operations conducted in 2013 found that fewer than one-third of farms were profitable in the previous year. Still, Mr. Green and his competitors are optimistic about the future of vertical farming. David Rosenberg, the co-founder and chief executive of AeroFarms in Newark, said although his business was not profitable, he believed that would change when it got larger. “You really need economies of scale for this to work, to address a host of complexities,” he said. AeroFarms plans to build large vertical farms worldwide and has raised more than $70 million to fulfill its ambitions. The company grows leafy greens aeroponically — by misting the roots with a cocktail of water, nutrients and oxygen. Mr. Rosenberg said his farm was 75 times as productive per square foot as a commercial field farm. The company is building its next farm and global headquarters in a 70,000-square-foot former steel mill in Newark. It will be the largest indoor farm in the world, Mr. Rosenberg said.